I'm trying something new this month, a video log bringing everything up to date on Thunder Mesa's expansion progress. If people enjoy it, I'll try to do a new one each month as the layout progresses. Don't forget to subscribe to the Thunder Mesa Youtube Channel! Expansion Update: San Lorenzo Arrives in Thunder Mesa! 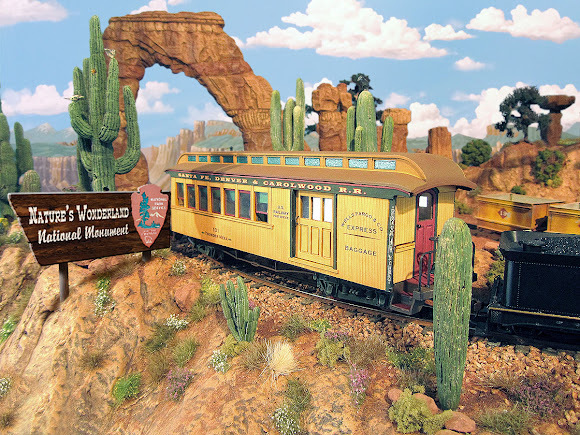 Verne Niner's Gazette Award winning San Lorenzo diorama has arrived at its new home in Thunder Mesa Country! 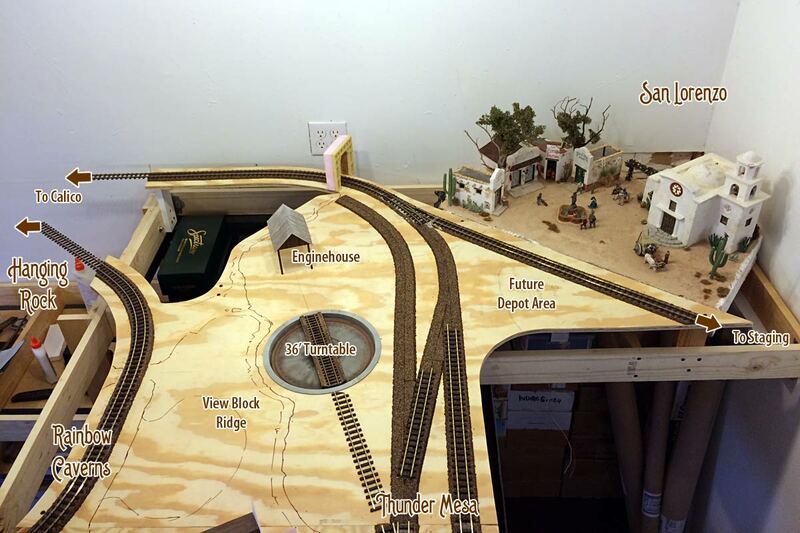 The 18"x30" scene fits snugly into a new corner of the layout and will represent one end of the line in operations. 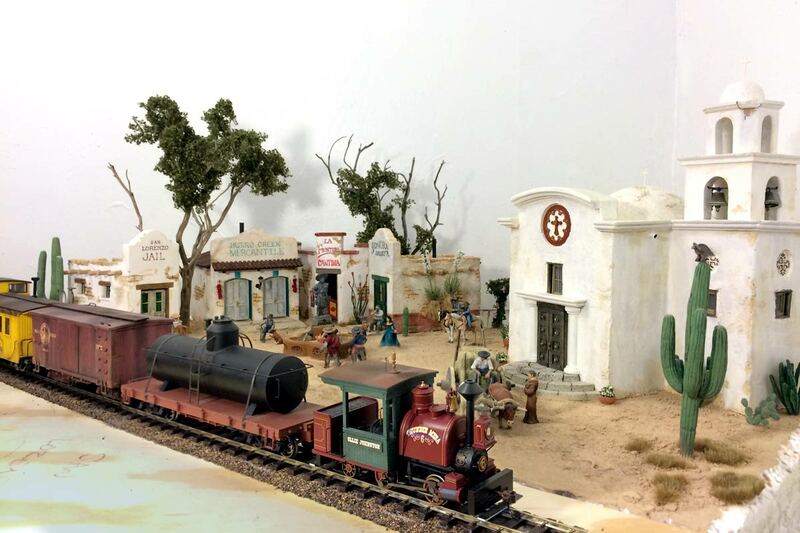 Back in October of last year, my friend Verne Niner announced that he would be dismantling his legendary Estrella & Sonora Grande layout in order to move on to new projects. 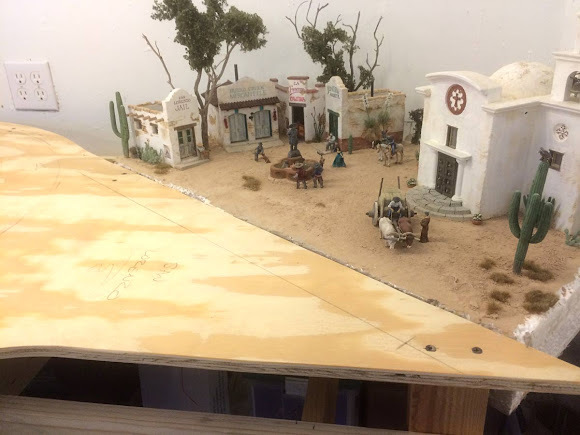 When he began to sell off the structures and equipment, I was lucky enough to call dibs on his wonderful San Lorenzo Village diorama. After months of planning, and a couple furious weeks of benchwork construction, I'm happy to report that the sleepy border town of San Lorenzo has been safely settled into its new home. The village now resides in a corner of the layout room on its own custom-built layout section. Physically, it's just down the aisle from Thunder Mesa town, but in operations, it will represent the far end of the railroad. Here's an overhead view of the new 48"x66" San Lorenzo section. This piece of benchwork acts as a literal bridge between the central Thunder Mesa section and the Hanging Rock and Calico sections along the wall. Changes always happen during construction and I've altered the plan somewhat by changing the orientation of San Lorenzo. Now the track enters the village from the opposite direction via a wye, a much more logical arrangement if this is meant to represent the "far end of the line." 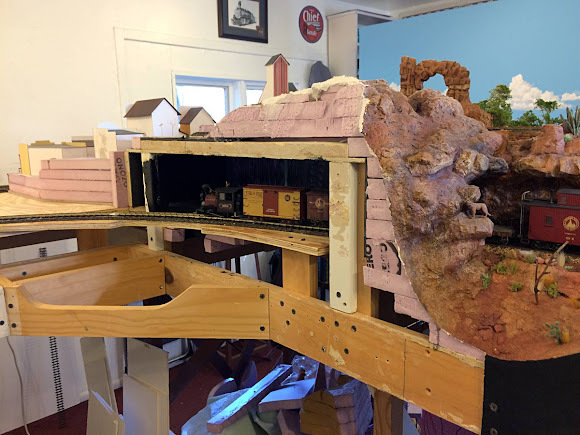 This change also allows for the San Lorenzo track to connect to a narrow staging shelf that will be built along the wall. What I'll lose in aisle width should be more than made up for in enhanced operations. This section of benchwork will also house a large chunk of Rainbow Caverns. The foreground track will curve through three cavern scenes before emerging at Hanging Rock. Here the existing layout joins the new benchwork and the new route through Rainbow Caverns. Passing trains will be viewed through rugged cave openings and the largest scene will feature some dramatic subterranean waterfalls. I use what I call the "box and stilts" method for building benchwork. Basically, that consists of a box-girder frame made from 1"x4" lumber and 1/2" plywood subroadbed atop 1"x3" risers or "stilts." 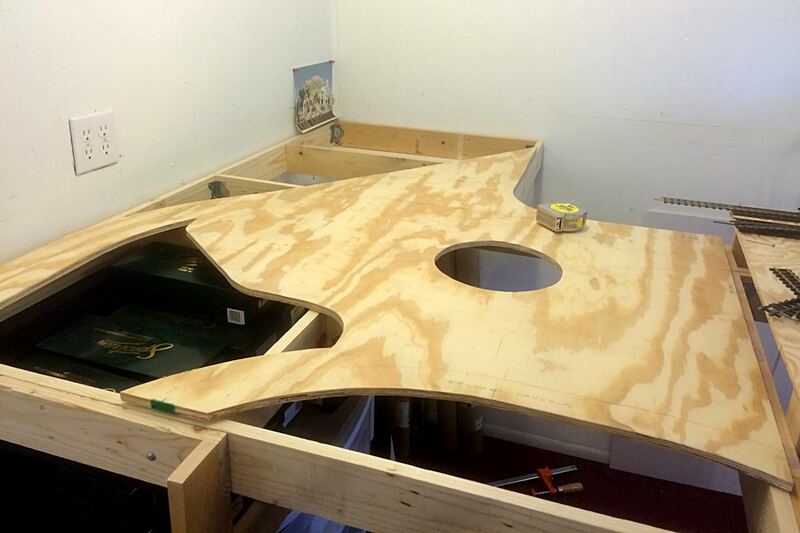 Here, the subroadbed top has been cut out and positioned but risers have yet to be added. I find this to be a simple, flexible, and somewhat economical method that has served my needs well on a number of projects. I cut the 1/2" plywood to size and then layout the track centerlines with a straightedge, bar compass, and actual track components like turnouts. 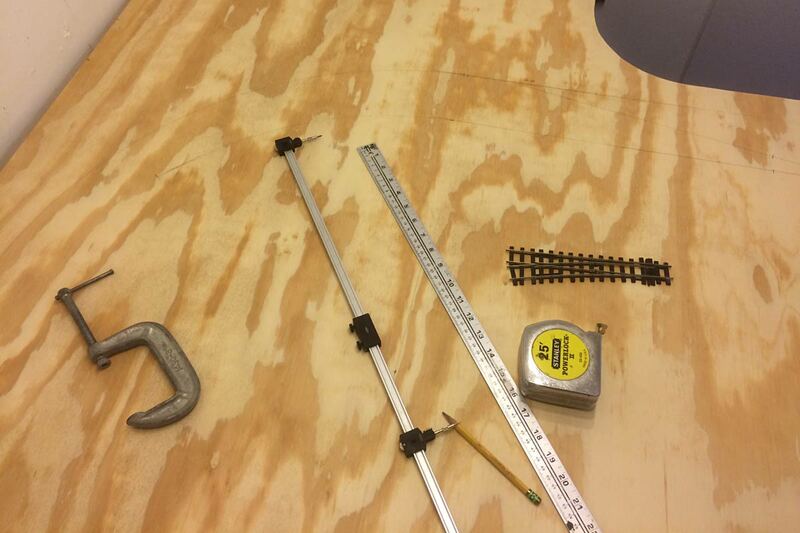 Then, allowing at least1.5 to 2 inches on either side of the track centerline, I cut everything out with a jigsaw. Here's the San Lorenzo depot area before cork roadbed and track were laid. The airspace between the roadbed and the box-frame makes it easier to add scenery below track level. Everything is held together with drywall screws. That should bring everything up to date for this week. 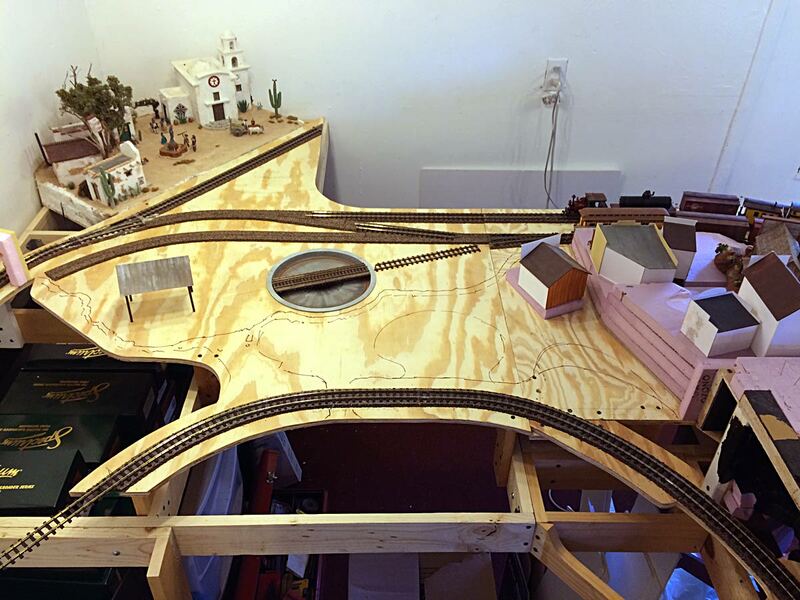 Now I'm just waiting for some more Peco On30 track components to arrive so I can finish up this section and get everything wired. As always, questions or comments are welcome below. Thanks for checking in, amigos, Adios for now! All those shots of bare plywood benchwork can get a little tedious so here's some eye-candy. 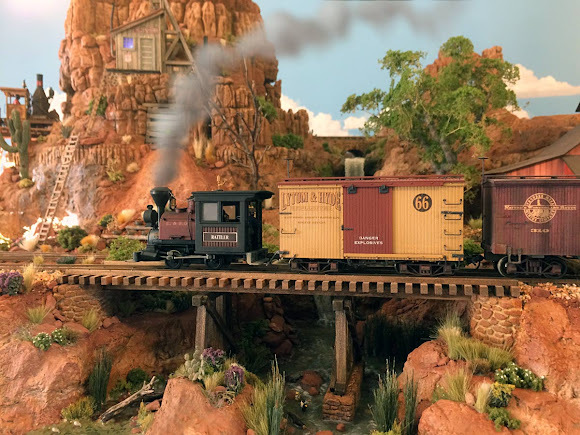 In addition to San Lorenzo Village, the TMMC also acquired E&SG Porter #3, the Rattler, along with Lytum & Hyde Explosives Co. boxcar #66 (I designed the decals and Verne Niner painted and detailed the Bachmann car). With its handsome red livery, the TMMC shop crews may never get around to repainting the three spot.